One of the largest hotels in New York's Adirondack mountains, The Sagamore originally opened in 1883. The sprawling, seventy-acre Sagamore resort stands on a private island on Lake George sixty miles north of Albany, the state capital. Its main building (pictured) is butterfly-shaped. 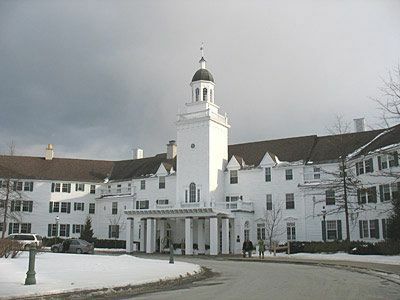 The Sagamore hotel's cupola and entrance are at the center, and its wings extend out from both sides. The Sagamore contains 323 guest rooms, one hundred of which are located in the main hotel. Had it not been our first visit, we would have known to have asked for a room with a view of the sparkling lake, around which most outdoor and all scenic activities take place. The bedroom was pretty, with a king-sized bed, a small writing desk, and a pair of wing chairs. Windows overlooked the front of the hotel's driveway and parking lot beyond. Our one-bedroom suite at the Sagamore had a living room decorated with a floral-upholstered couch and matching chair, a large ottoman, a wing-backed chair, and a variety of tables from different eras. Rooms are air-conditioned and have dataports. Some suites also have a terrace and wet bar. In-room movies are available. Oddly, a fluorescent light was positioned directly above the TV set, which is recessed into a living room wall. We couldn't find the "off" switch, but the bulb was easy enough to unscrew. There is also a grill at the golf club, and the Veranda offers food and drinks during the day. In warm weather guests can enjoy lunch or a lobster-bake dinner at the Pavilion down by the lake. Trillium bis, the hotel's signature restaurant, is one of the most beautiful, elegantly designed hotel dining rooms anywhere. Its food is good, but the off-season service we experienced left something to be desired. A fish entree was delivered cold (it had been sitting too long in the kitchen) and a requested birthday candle arrived a day late. The main dining room at The Sagamore is located on the opposite side of the hotel lobby. Breakfast fans have the option of a cold buffet (complete with smoked salmon and fresh bagels); hot and cold buffets, plus an omelette station; or ordering from the menu. In the morning everything was scrumptious and presented in an appetizing way. Dinner in the main dining room on the second night of our visit was an expensive prix-fixe buffet ($75 per person, drinks extra, plus an 18 percent tip). Salads and desserts were most palatable; neither of us was impressed by the steam-table entrees. The Sagamore is a family hotel that once a year hosts an affordable Sweetheart Weekend around Valentine's Day (and is relatively free of children at that time). In addition, there is also a Couples Renewal package that focuses on spa activities. A resort designed for active vacationers, the Sagamore is set up for guests to pursue their passions throughout the year. The Sagamore Hotel features a large, clean indoor L-shaped pool surrounded by chaises and a whirlpool. Since it is located in the far end of one wing, guests who plan to use it may want to request a room nearby. Otherwise, it's a bit of a walk to reach. Lockers, showers, and a changing room are provided. Of all the meals we experienced at The Sagamore, lunch at the casual and unpretentious Mr. Brown's Pub, where TV's Rachel Ray once waited on tables, was our favorite. The Adirondack style decor was appropriate to the setting, and the menu was varied enough to suit different appetites. Service was friendly and attentive and food was delivered hot and on time. The sunny Veranda upstairs, at the center of the hotel, is another popular gathering place. It draws guests early in the morning for coffee, in the afternoon for tea, at cocktail hour for the raw bar, and into the evening for drinks. During the height of the summer season, the number of visitors to the area picks up (as do rates). The Saratoga Race Track and Adirondack Theater Festival at the Charles R. Wood Theater in Glens Falls provide additional incentive to visit in prime time. The Sagamore Hotel hosts many of the biggest weddings in the Adirondacks. With its lakeside setting and multiple indoor and outdoor celebration spaces, the hotel can accommodate wedding parties of all sizes. Thanks to the variety of facilities, the Sagamore has places to host everything from the rehearsal dinner to weekend-wedding activities to the farewell brunch in addition to its ceremony and reception spaces. And because of its gorgeous Lake George setting, wedding pictures are likely to be lovely. Saturday is the preferred day for weddings, which means couples must reserve a date well in advance. Weddings that take place on a different day of the week are most affordable. The Sagamore is a good spot for active couples who either have children or don't mind vacationing surrounded by them. Lake George (the body of water, not the town) is simply magnificent and may inspire you to try a sport — sailing, kayaking — you never have before. Decor. Suites could use some freshening up. Housekeeping. On our first night, the bed was turned down and a ballotin of yummy chocolates was left atop it. But the room was not cleaned nor the bed made by 3:30 pm the next day. A call to housekeeping yielded a chambermaid who tidied the room while we were at dinner. Food service. The less pretentious and more casual the food we sampled at The Sagamore, the better it was. When the hotel sticks to the basics, charges reasonably, and provides attentive service, it's an appealing place for a getaway. As is common in the travel industry, the writer was provided with complimentary accommodation and meals for the purpose of reviewing those services. While it has not influenced this review, About.com believes in full disclosure of all potential conflicts of interest. For more information, see our ethics policy.